‘Hare’s fur’ bowls, whose black glaze is suffused with fine brown hair-like streaks resembling fur, made in Fujian province in south China (e.g. Barlow collection, [LI1301.268]), were so popular as tea bowls both in China and Japan, that many northern kilns copied them. The northern specimens, like the present piece, differ, however, in material and in potting. The bowl has steep conical sides, slightly flared towards the rim, and a low broad foot. It is fully glazed in black with overall ‘hare’s fur’ markings, the glaze mutating to brown towards the rim and fading to a transparent layer at the rim itself. 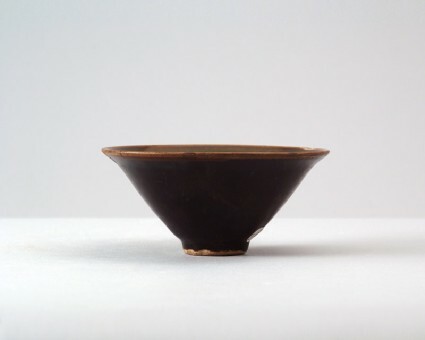 The base and footring are unglazed with small accidental drops of glaze on the base, and the glaze has an uneven lighter patch on the outside.